Copyright, 1884, by Willis Woodward & Co. Written and sung by Banks Winter. Sail! home, as straight as an arrow. In her dear little home she is waiting for me. That's where the girl of my heart waits for me! 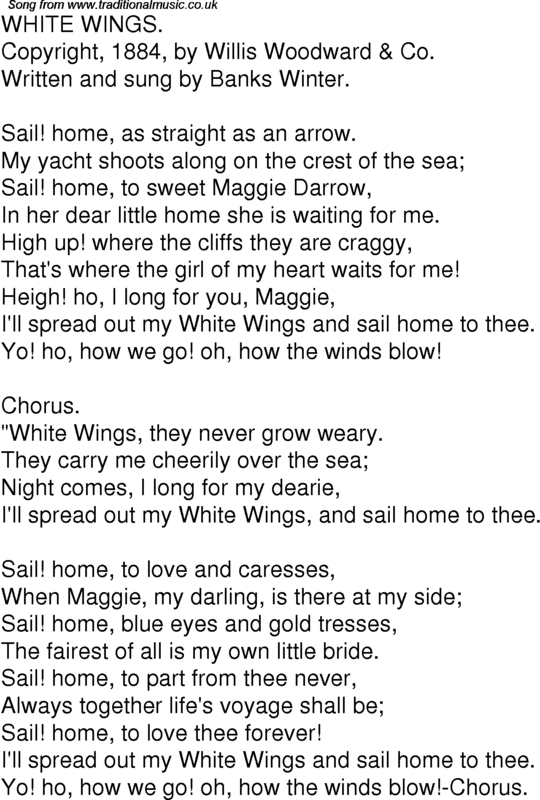 I'll spread out my White Wings and sail home to thee. Yo! ho, how we go! oh, how the winds blow! "White Wings, they never grow weary. I'll spread out my White Wings, and sail home to thee. The fairest of all is my own little bride. Sail! home, to love thee forever! Yo! ho, how we go! oh, how the winds blow!-Chorus.